One of my top 5 writers is Polish Science Fiction writer Stanislaw Lem (1921 – 2006), perhaps best known for his amazing work, the 1961 Solaris, later made into a movie with George Clooney. Both of which sum up Lem’s work. Brilliant, interesting and completely different. He has been called the most widely read science fiction writer in the world, with his books translated into 41 languages and over 27 million copies sold. His works explore philosophical themes; speculation on technology, the nature of intelligence, the impossibility of mutual communication and understanding, despair about human limitations and mankind’s place in the universe. Heavy going, but worth the effort. Although – if you don’t like philosophical themes, Lem is definitely not for you. Another favorite is Fiasco. In the far future, humans journey across light years to contact an alien civilization. They get there and the aliens are indeed there, but… well, they are really alien and don’t want to talk – at all! With typical human enthusiasm, the captain insists that the aliens DO talk, since they have come all this way and everything. And proceeds to try and force them to talk. However the aliens are too busy enthusiastically waging a genocidal war against each other, and really have no interest. And in fact, the aliens are so alien and strange there isn’t really anything to talk about anyway. This conundrum is totally and completely unacceptable to the captain, who persists in forcing them to talk the way he wants them to. A series of miscommunications and misunderstandings ensue, ending in a Fiasco of mutual destruction. A fascinating book filled with interesting and novel ideas from a completely different perspective. The main character is a ‘cowboy’ who recklessly proceeds with whatever he thinks, and comes to a sticky end because of his reckless behavior. Another favorite is His Masters Voice, which I ordered from Amazon and saved up for holiday reading in Cancun, but immediately found it is not the type of book to read on the beach. The writing is so compelling it demands your complete attention. Not the type of book you can read for a few minutes then dreamily gaze out at the ocean. Perhaps the most engrossing book I have ever read. A message is received by SETI, or what may or may not be a message, and a team is secretly setup on a military base to examine and decode the message. But how can you decode something (from an alien) that you don’t even know if it is a message or not? And if you decide (because you can’t prove it) it is a message, then where to start? Ultimately the project is a failure and they are unable to decode the message. Or is it a failure? Or is it just background noise from outer space? 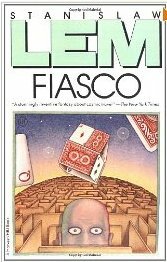 Perhaps what is most interesting about Lem is his dispute with the Science Fiction Writers of America (SFWA). Presumably, the SFWA felt obligated to include him in their society because his work was so brilliant, even though, being Polish, he was technically not eligible. 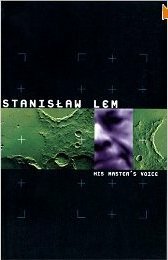 Indeed, reading any of Lem’s novels you can see why they felt they had to do something. He leaves everyone else in the dust and his ideas and point of view are pure genius. … that sci-fi appears to have been elevated to a level of both kitsch and mystification that make it a force to be reckoned with. By kitsch I mean a literary form that claims to be a mythology of technological civilization while in fact it is simply bad writing tacked together with wooden dialogue. Why would someone so obviously brilliant write something like that? Perhaps so convinced of his own brilliance and self-righteousness, he didn’t anticipate the reaction? Or perhaps didn’t care? What is really interesting, and typical of someone so brilliant, is that he was right.